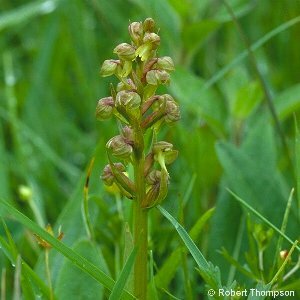 The Frog Orchid (Coeloglossum viride) is a rather inconspicuous plant on account of the flowers being greenish, so that the plant, often quite small, merges into the background vegetation. Sometimes, however, the flowers have a reddish tinge and the height of the plant can vary from about 3 to 12 inches. 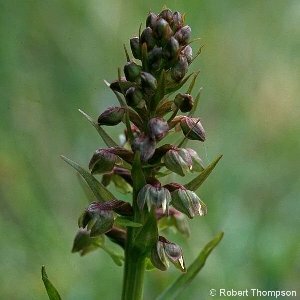 The lip which hangs down from the flower is strap-shaped and has three short teeth at the end. 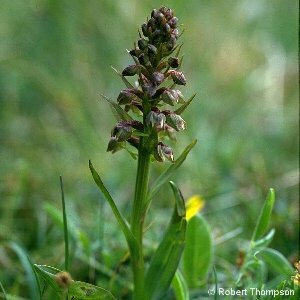 The plant is most often found in dry short turf on lime-rich soils including sand dunes, but can also be found in damper situations, even on raised humps of ground in mires which are not too acid. The lower leaves are quite broad and blunt, those higher up the stem are shorter and narrower. Below the soil surface are the roots (infected with a fungus) and two roundish tubers. Flowering period is June~August. can also occur in mires or bogs which are not too acidic. 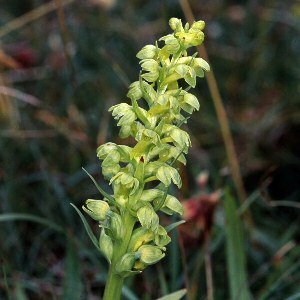 All names: Coeloglossum viride (L.) Hartman; Habenaria viridis (L.) R.Br.